Published on July 23, 2010 in Blogging Ideas, Blogging Tips, Cool Websites and Blogs, Exponential Mindset and Fun. 0 Comments Tags: First Page news, Front Page News. 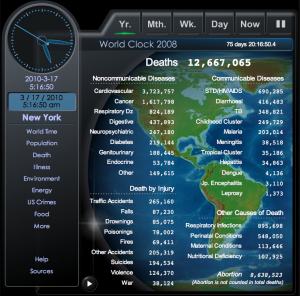 Published on March 30, 2009 in Blogging Ideas and Exponential Mindset. 0 Comments Tags: Bloggers, Blogging Content, Content For Blogs, Marc Dussault, MasterMind, MasterMind Group, Robert Cialdini, Think and Grow Rich. Once you’ve launched a blog, you quickly realise that it’s an on-going responsibility to keep coming up with interesting and relevant stuff to write about. Creating a MasterMind Group is one way to make it a lot easier – in fact if you do it right, it will become almost ‘effortless’. I’ve written a book How to Create a Fun, Effective and Powerful MasterMind Group to Catapult You To Exponential Success that you can purchase and at the same time get the exclusive 66-minute Exponential Mastermind Audio Interview and Word-For Word Transcript. As a blogger, the MasterMind concept is crucial to make sure you never run out of new, relevant and interesting material. 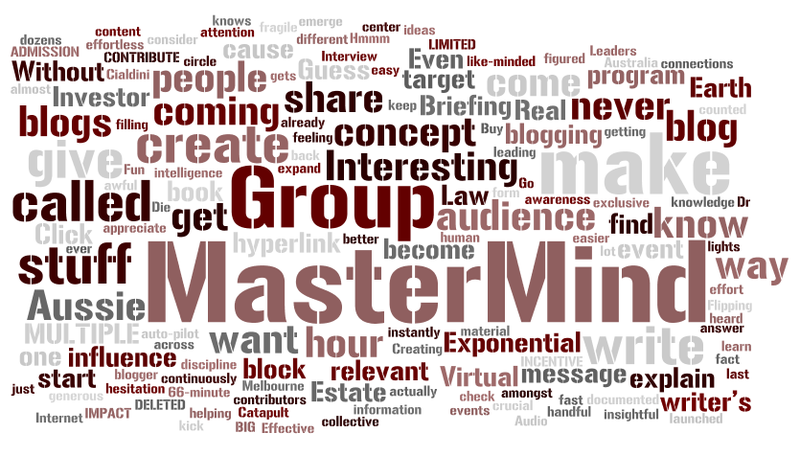 A MasterMind Group is a handful of people who appreciate what you are blogging about and want to CONTRIBUTE to your cause, message and audience. They are like-minded people who are passionate, generous and insightful. They know what you’re into and give you content without reservation or hesitation. Your MasterMind Group Members will find stuff you’d never find in a million years. They’ll make connections for you and your audience you otherwise would never consider. By tapping into their collective intelligence, you’ll instantly and continuously expand your circle of influence, awareness and understanding about your subject, cause, discipline. You’ll become the center point of attention, the nucleus of knowledge – the preeminent source of information. I have multiple blogs with dozens of contributors who give of themselves and share their ideas, thoughts, tips and tricks with me so that I can then share them with you. So how do you get this MasterMind Group to form? Buy my book if you want to learn the step-by-step process, but the short and easy answer is – CREATE and GIVE as much VALUE as you can and the Law Of Reciprocity will kick in – it’s the human law of persuasion and influence as documented by Dr Robert Cialdini that will start to reward you. Leaders amongst your blogging readership will emerge and start to give you stuff – stuff that will make people come to your blog and want to come back AND SUBSCRIBE! 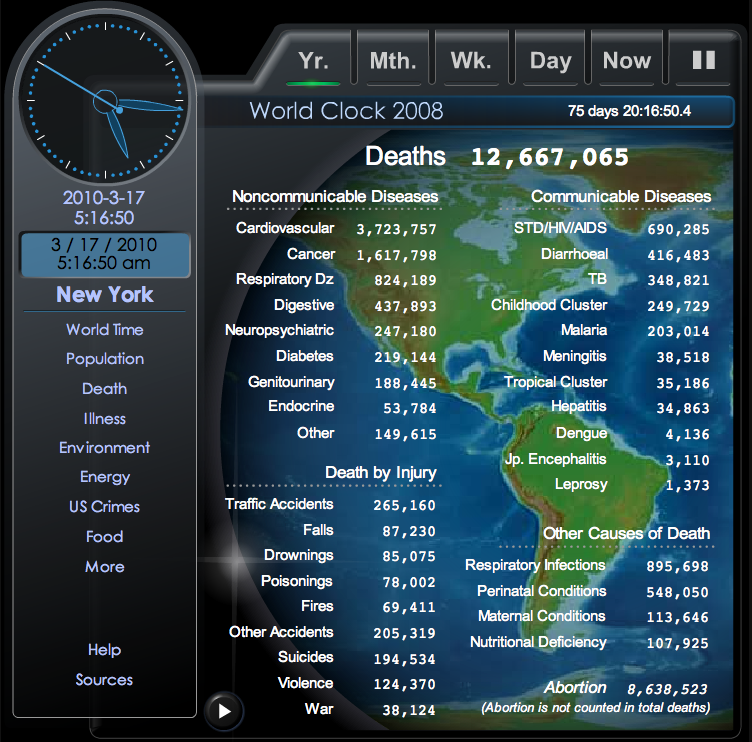 Published on December 1, 2008 in Blogging Ideas, Exponential Mindset and Fun. 2 Comments Tags: Blog, Blog Content, Blogging, exponential, Find Blog Content, Get Blog Content, Internet, Marc Dussault, Where Blog Content. You can create valuable content for your blog by first telling people what they don’t know they don’t know – that’s what’s called ‘intriguing’ and on its own will fascinate some of your readers. The exponential value however is to reveal what your readers don’t know they already know. That unleashes what I call the Exponential Potential™ creating a sense of confidence and excitement of what’s possible FOR THEM. Because they now know they know ‘X’. If you keep revealing stuff they either don’t know they don’t know or don’t know they know – you’ll have them hooked and they’ll keep coming back for more. Whatever you do, don’t tell them what they already know they know OR worse what they know they don’t know. If you tell them what they already know, they’ll never come back and if you remind them of what they know they don’t know, you’ll not only lose them as blog visitors, but you’ll never get them as clients, affiliates, in fact they’ll avoid you at all costs. So there you have it – a different perspective on how you can create valuable content for you blog! In an upcoming post, I am going to highlight why and how you must consider having multiple blogs to MULTIPLY your results and enhance your communications.